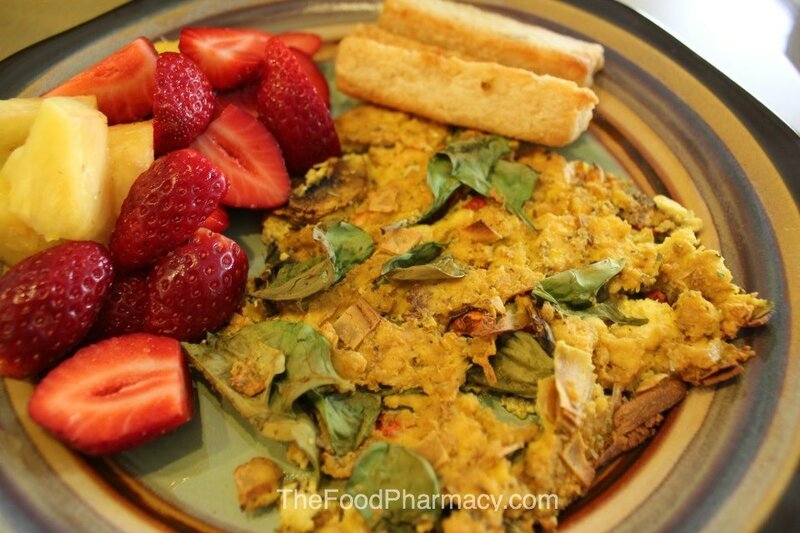 Frittata is an Italian dish similar to an omelet. This vegan variation skips the eggs and oil but not the taste. Buon appetito! Preheat oven to 400F. Grease ligthly a long pyrex or 2 shallow 9-inch pie dishes and set aside. Crumble tofu in a large bowl with hands until it looks like feta cheese. Stir in nutritional yeast, dijon mustard, onion and garlic powder, turmeric and Herbamare or salt and pepper. Transfer to pie dish and pat down firmly with a spatula until nice and tight. Bake for 25 minutes until the top is firm and slightly brown. Let frittata cool for 5 minutes in counter before serving. This website is for informational purposes only. Consult your physician prior to changing your diet. The information, data, material contained, or presented is not intended to be taken as medical advice.